Nifty posted a good post budger tally with a weekly gains of 3.4%,Coming Week IIP data which is bound to release on 10 March will decide the furthur Trend. 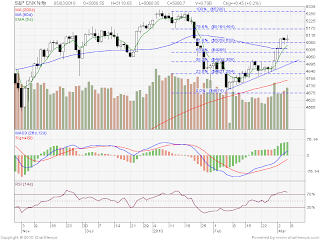 As of now we are in good Uptrend and 5065 is proving to be a good support for Nifty.If we take the fibo levels as indicated on charts we will find a resistance at 5164 levels.As we have closed above 5 WEMA so this is further evidence that trend is quiet strong and we may see a good rally till 5164 levels. around 5070 level with the SL of 5050 for the target of 5135/5170/5220. 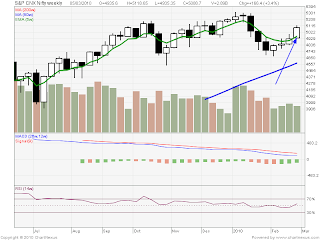 On the way down if 5050 breaks we may see the levels of 5035 4980 Levels.